Banuve Tabakaucoro clocked 10.20s in the Open Men’s 100m final to finish ahead of rivals Aaron Stubbs of Australia (10.41) and Rodman Teltul of Palau (10.52) in Suva last night. Photo: Paulini Ratulailai. Pacific sprint king Banuve Tabakaucoro came short of reaching the 10.16 seconds qualifying time for the 2016 Rio Olympics after clocking 10.20s in the 100metres final last night. 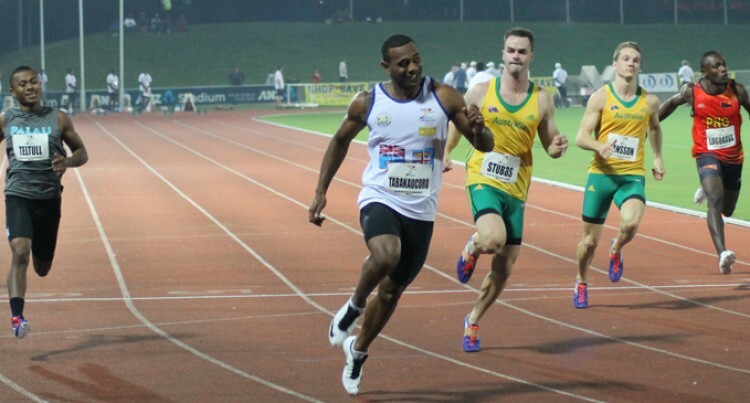 Banuve won gold ahead of rivals Aaron Stubbs of Australia (10.41) and Rodman Teltul of Palau (10.52). Dubbed as the ‘Bau Bullet’ he also set a new national record and walked out of the ANZ Stadium a happy man. “It was a very good performance, I set a new national record and I’m a happy man,” he said. “This is a very special moment for me because I have been taking part in tournament overseas and have been setting new record. “But tonight I set a new record in front of my home crowd,” Tabakaucoro added. The other Fijian male Olympic contender Leslie Copeland will participate in the senior men javelin final at 2:30pm today. In the women’s senior division Pacific sprint queen Toea Wisil proved too strong and won gold with a time of 11.44s. Emily Coppins of Australia won silver (12.04s) while Fijian Makereta Naulu won bronze (12.12s). Younis Bese finished fifth (12.28s), Alesi Finau seventh (12.31s) and Sisilia Seavula eighth (12.40s).